Need a Low Cost Instrument for Many Tasks? 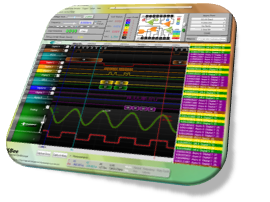 USBee offers the only test instruments in the market that have integrated a protocol analyzer, logic analyzer, oscilloscope and signal generator into a single test instrument. The protocol analyzer includes serial busses such as I2C, CAN, SPI, I2S, SDIO, Async, 1-wire or any custom serial or parallel protocol. Having all four functions in a single system eliminates the complexity of triggering multiple systems together, saving time and effort. In addition, the buffer for the RX and DX ranges from 16 million to 200 million samples. In combination with data compression, days of data can be captured, enabling designers to find and resolve the most obscure difficult bug. Learn more about Caontroller Area Network (CAN) Here. The USBee RX and DX are more sophisticated than many MSOs in the market, providing more advanced capabilities and a higher debugging level, saving debug time. For instance, other MSOs may have a decoder for protocol, but not a specific analyzer for protocol analysis only. A protocol decoder can pinpoint the beginning and end of a protocol flow, but only returns hex values of the packet contents. The user will still additionally need to review the datasheet to look up the address, analyzer register function and then make a manual conversion of the HEX value into a meaningful test result. The USBee RX and the USBee DX display the data in the same format as the other MSOs, a competitive advantage is the data displayed in higher level packet formats. 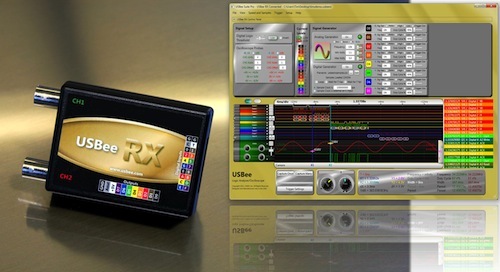 The USBee RX and DX protocol analyzer can automatically interpret the HEX value within the field and provide an interpreted result, in any format desired by the user. Additional referencing of a datasheet to determine and understanding the packet values is not required. The USBee RX and USBee DX are available at a fraction of a price compared to MSO equivalents. Here is a brief video demonstration. 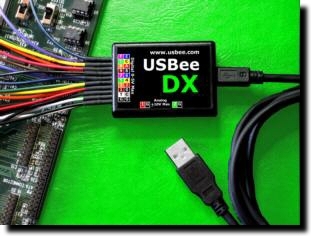 Typical users of USBee RX and DX include firmware designers, test validation engineers and field application engineers for both semiconductor companies and systems manufacturers benefit from the USBee RX and DX. Ultimately every design uses serial bus communication to control various parts of their system. The portability of these products is especially attractive to field application engineers who use them to characterize a problem in the field. To purchase these excellent tools please contact Test Equipment Connection. This entry was posted in Site News and tagged SBee RX. Bookmark the permalink.